Blooms in the Rotunda of the National Museum of Natural History. Our friends at The Biodiversity Heritage Library asked this question in social media last year and offered up vibrant, joyful portraits of the amaryllis instead. But one commentator declared “Poinsettias rule!” And indeed poinsettias do reign as an economic powerhouse of the nursery industry, cultivated all over the world. 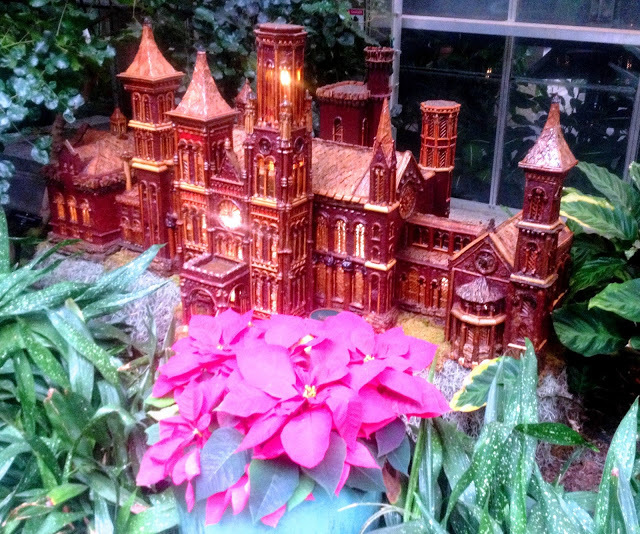 The public areas of the various Smithsonian museums and the neighboring Botanic Gardens on the Mall in Washington now have abundant, seasonal displays of poinsettias, beautiful specimens propagated by the talented horticulturists of the Federal greenhouses. The palette of colors and shapes are wonderful, never a dull sight this time of year. Potted plants in the Smithsonian Libraries’ collection areas are generally discouraged because of the insects they may harbor, potentially harmful to the books on the shelves. Consequently, there are no seasonal flowers welcoming researchers to the reading rooms. However, anyone can find holiday blossoms in the Libraries by going on a virtual plant hunt. 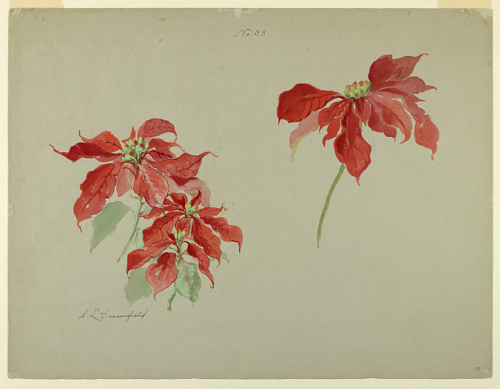 The range of holdings in the Smithsonian Libraries provides both images and a full portrayal of the poinsettias’ history (some of it mythic) and, a renewed appreciation for this remarkable plant. There is still a fuller story yet to be told, to separate oft-repeated lore from actual evidence, waiting to be fully investigated in the Libraries’ resources. It is commonly known that the poinsettia was named to honor physician, politician, diplomat, and amateur botanist, Joel Roberts Poinsett (1779-1851). He was a special envoy, then first Minister, representing the United States in Mexico from 1822 to 1830. Perhaps not as well-known is that the flower (the showy part is actually leaves or bracts) had an association with Christmas long before it was promoted by American and European nurseries. Further, the relationship between the plant and Poinsett is not as straightforward as often portrayed. The Aztecs of the principal city of Tenochtitlan (now Mexico City) imported the plant from southern Mexico to northern Guatemala, where it thrives in the landscape of lower altitudes and warmer climate. In the ancient Nahuatl language it is called cuetlaxochitl ̶ xochitl meaning ornamental flower. The winter-blooming plant was used for medicinal purposes (from its sap) and as a source of red dye (from the bracts). There is also evidence that cuetlaxochitl was used in religious ceremonies, its brilliant color representing purity. Ancient Aztec herbals, the few surviving from the Pre-Columbian period, may have references and illustrations to both the health properties and ritual uses of the plant. There are facsimile copies of these rare works in both the Smithsonian Libraries’ Anthropology, National Museum of American Indian and Special Collections Libraries. As with other pagan rituals and symbols – think of winter greenery (pine, holly, mistletoe), of wreaths and trees brought indoors and the yule log – the star-shaped flower was incorporated into Christmas celebrations. In particular, it had a role in the nativity procession of the Fiesta of Santa Pesebre. After the Conquest, with Spanish missionaries in Mexico, the plant became known as “Flore de Noche Buena” or “Flower of the Holy Night” (Christmas Eve). In a 2011 article by the Agricultural School of Purdue University, many of the myths of the poinsettia were investigated and debunked. There is no evidence, only legend, that it was Poinsett who introduced the plant to the United States, first to his native South Carolina. 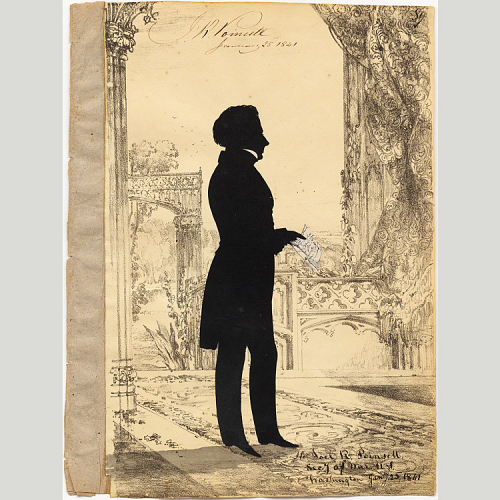 As a learned gentleman, he may have had a role in sending seeds to colleagues in Philadelphia where poinsettias were displayed in 1828. From that city, Scottish nurseryman Robert Buist brought cuttings to James McNab in Edinburgh. A German botanist, Karl Willdenow, provided the botanical name, Euphorbia pulcherrima, first published in 1834, by Johann Friedrich Klotzsch. Back in Edinburgh, another botanist, Robert Graham changed the name in 1836 to Poinsettia pucherrima, although that version never did take officially. Another story is that William Hickling Prescott, the author of The History of the Conquest of Mexico (1843) gave the name to honor his friend in that publication. There are many copies of this title in the Smithsonian Libraries. As early as 1836 Curtis’s Botanical magazine (London, volume 63) published a stunning illustration entitled Poinsettia pulcherrima (Showy Poinsettia). There is research, appropriately enough published by The Botanic Garden and Botanical Museum Berlin in the journal Willdenowia, finding that earlier botanical expeditions to Mexico predating Poinsett had sent the first cuttings back to Europe. The Royal Botanical Expedition to New Spain, led by Martín de Sessé y Lacasta (1751-1808) and José Mariano Mociño (1757–1820) is the first contender. Following that were the explorations of Alexander Freiherr von Humboldt (1769-1859) and Aimé Bonpland (1773-1858) and, after the independence of Mexico in 1821, the collectors for the Natural History Museum in Berlin, Christian Julius Wilhelm Schiede (1798-1838) and Ferdinand Deppe (1798-1836). Poinsettias were prized in Europe and America from the mid-19th century, although still a luxury grown in greenhouses. The Ecke family nursery, founded by German immigrants setting in Hollywood, California, was the great popularizer of poinsettias. 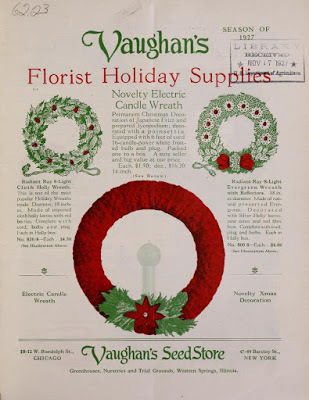 The Eckes focused their floriculture business exclusively on poinsettias from 1909. Talented in their cultivation of exotics and clever in marketing, the nursery made the plant widely available. Their promotion of the plant can be seen in nursery catalogs digitized by the Biodiversity Heritage Library. The Ecke poinsettia nurseries were taken over by the Dutch conglomerate Agribo in 2012, now owned by a private equity group comprising the third-largest horticultural business in the world. 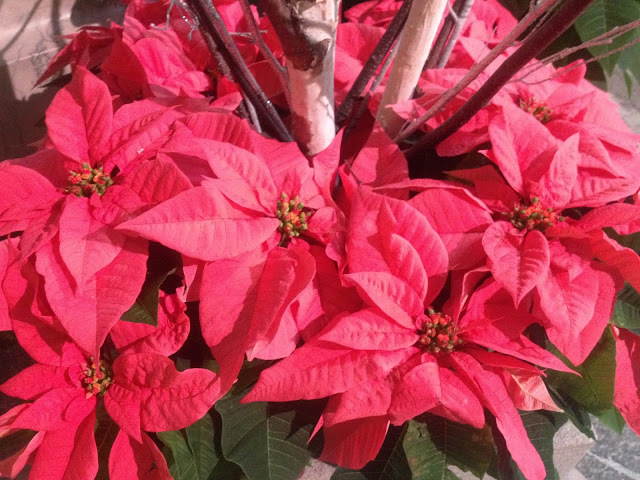 The growth in the commercial trade of the poinsettia can be traced in nursery catalogs. There are a great number in the trade literature collection of the National Museum of American History Library. This title page is courtesy of the Biodiversity Heritage Library, digitized from a copy in the National Agricultural Library. In our search for a fuller history of the plant as preserved in the Smithsonian Libraries, it should be pointed out that Joel Roberts Poinsett is also a figure in the pre-history of the Smithsonian, as a co-founder of the National Institute for the Promotion of Science and the Useful Arts. This organization was made up of prominent figures advocating a vision for the use of James Smithson’s unexpected bequest to the United States. There are several works either written by Poinsett or associated with the National Institute in the Smithsonian Libraries’ Special Collections. Poinsett’s death date, December 12th, is now National Poinsettia Day in the United States. Pause and admire living blooms you pass by and ponder the plant’s rich, if not entirely, settled history. 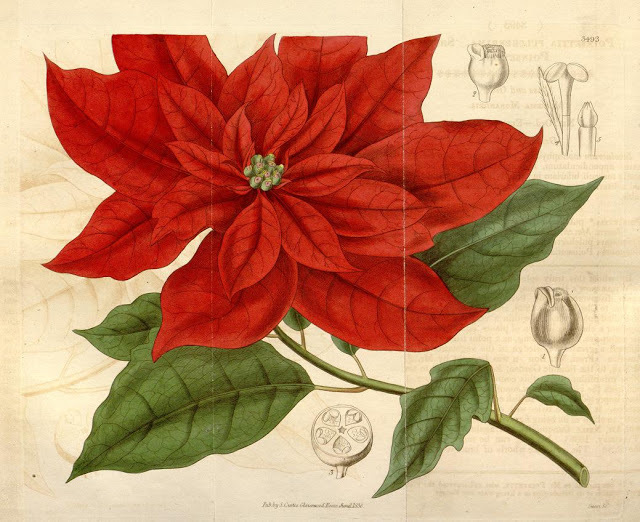 Then consider exploring the wide-range holdings of the Smithsonian Libraries ̶ from the art, natural and American histories, botanical, horticultural, anthropology, rare books, digital resources, and trade literature collections ̶ to find new discoveries of the story of the poinsettia.